INDUSTRY.co.id - Japan - BPJS Employment has established cooperation with the Japanese government through Japan International Cooperation Agency (JICA) since 2016. 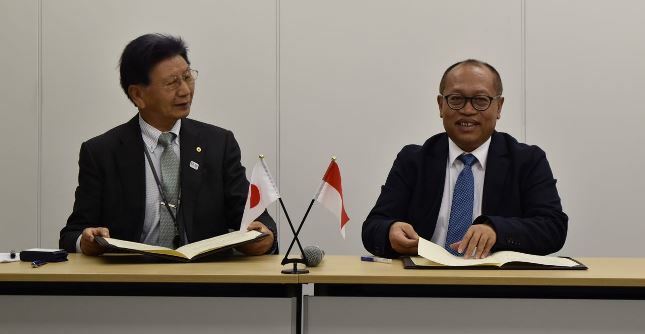 Cooperation among others is cooperation in efforts to increase the membership of social security employment in Indonesia, through the adoption of Sharoushi agency system, which proved to have been successfully applied in Japan. To reap the addition of participation BPJS Employment initiative to run various strategies, one of them developed a system of membership agencies adopted from Sharoushi and Japan Collection System. This agency system in Indonesia is called PERISAI which is the abbreviation of Social Security Mover of Indonesia. Agus said, PERISAI pilot project has been implemented in 10 provinces in Indonesia, and the result is quite good and welcomed positively by the workers. Further BPJS Employment improves PERISAI with internet-based digital application system operated through smartphone. This app integrates the existing system in BPJS Employment with the system at the Bank. With such digital applications the entire process is handled electronically, Straight Trough Processing (STP), Single Sign On, and Paperless. In the meeting the BPJS Employment also demonstrates the use of PERISAI applications that have utilized digital technology for handling operations, and initiatives to gain appreciation and praise from the entire audience. "So we did not adopt Sharoushi's system roundly, but we adapted to Indonesian culture and we perfected it by utilizing digital-based information technology. This application not only facilitates PERISAI's work system in acquiring participants, but also facilitates real time monitoring by BPJS Employment of acquisition by PERISAI. In addition, the application of PERISAI used BPJS Employment to minimize the risk of fraud ", said Agus.